Welcome to Road Running Course Measurement in UK. accurate measurement of courses for road running. Runners in England, Scotland & Wales will find lists of measured courses. Race Organisers can find out how to get your course measured and as certified accurate. N.B. Ideally, you need to book a measurer 6 months before your race. Course Measurers will find a range of resources. 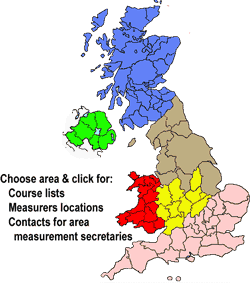 The UK Course Measurement Working Party has set up the Association of UK Course Measurers. The AUKCM Website contains minutes of meetings and some historical documents. Runners and Officials occasionally query the length of races. Where possible we investigate to see if there is evidence of error. We publish brief reports of these investigations. Try our introductory lesson then do the free theory course & practical.